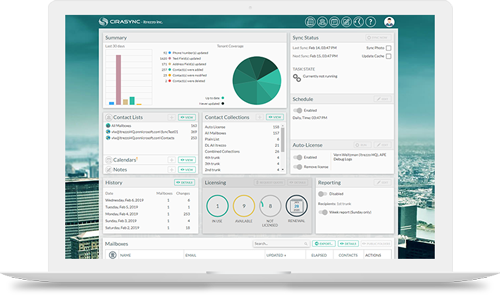 Enhance Office 365 productivity for your tenants with the secure CiraSync Saas platform. CiraSync instantly and automatically syncs enterprise Global Address List (GAL), public folders, and calendars to Exchange thus enabling your clients to access the latest contact and calendar information, with full confidence in the accuracy of the data, on their smartphones. Managed Service Providers, Cloud Service Providers, Value Add Resellers, Microsoft Cloud Partners, and Microsoft Consultants all over the world use the CiraSync SaaS as an immediate win for their tenants. The CiraSync solution is used by more than 5,000 companies around the globe in over 100 countries. You can use the CiraSync Partner Portal to manage tenants, usage, and billing from a single console.